Konstanty Ildefons Gałczyński, the poet who coupled contradictions like few other versemakers of his time, passed away over 60 years ago. We bring you all of his polymorphous faces as well as a few of his masks. Gifted with an extraordinary ease of the pen when inspiration struck, Gałczyński conjured up the epic poem Ball at Salomon within just a few hours. He was capable of writing on any assigned topic, and this ability won him incredible popularity. After the war his fame reached heights nowadays reserved for stage and screen celebrities, and even so he was often accussed of being incomprehensible. Due to his collaboration with the Prosto z mostu magazine the political label of a fascist stuck to him for many years, even when he became "a communist writer " - another moniker he gained, despite never being able to write a pure propaganda piece. In addition to those titles, Gałczyński was also mastered of the grotesque, pure nonsense and abstract humour, the magician with rabbits in his hat. This is the Gałczyński of the Zielona Gęś (Green Goose) and Listy z fiołkiem (Letters with a Violet). He stands right beside the Gałczyński of deep, existential poems such as Niobe, or Notatki z nieudanych rekolekcji paryskich (Notes from a failed Parisian retreat), as well as the Gałczyński who wrote poems for his wife Natalia, the author of verse that praised Stalin, and the surrealist behind Bal u Salomona (Ball at Salomon’s), Zaczarowanej dorożki (The Enchanted Carriage), Serwus, madonna (Ciao, madonna), Inge Bartsch, Skumbria w tomacie (Tomato Scumbria), Pieśni o żołnierzach z Westerplatte (Song on the Soldiers from Westerplatte) and Strasna zaba (Tewwible Fwog). So, how many Gałczyńskis were there? The pages of Wiadomości Literackie (Literary News) magazine were almost permanently closed to Gałczyński (he only published one poem in the WL). He was one of the few extraordinary poets whom editor Mieczysław Grydzewski did not print. The interwar poetic phenomenon of K.I. Gałczyński (who was born in 1905 and died in 1953, aged 48) was born somewhere on the crossroads of a classicistic trends and the avant-garde, in the broad sense of the term. However, it is impossible to place him in any definitive spot on the map of literary trends. He appropriated the merits of Skamander (a group of experimental poets, including Julian Tuwim, Antoni Słonimski, Jarosław Iwaszkiewicz, Kazimierz Wierzyński and Jan Lechoń) as well as those of futurist poetry, cubism and surrealism, and yet he never signed his name under any of these programmes. Although his talent and sensibility seem closest to Skamander, he never wrote for the title founded by the group. Gałczyński became connected with Kwadryga, a literary group that attracted poets of the socially engaged orientation and whose members frequently criticised Skamader’s indifference. Gałczyński would meet up with the Skamadrites on the pages of Cyrulik Warszawski magazine. Additionally he wrote for any title possible and wherever he was desired. Perhaps it was precisely conflict and resentment against the leading circles of poets that pushed Gałczyński into the arms of Stanisław Piasecki and his Prosto z mostu magazine. This new title with a radically conservative and right-wing profile was created in opposition to the Wiadomości Literackie and Piasecki. The editor-in-chief was capable of attracting many young talents unable to find themselves in the WL. On occasion even Gombrowicz wrote for Prosto z mostu. Gałczyński, estranged from the WL, was finally granted what he always dreamt of - the possibility of promotion and the popularity that followed. 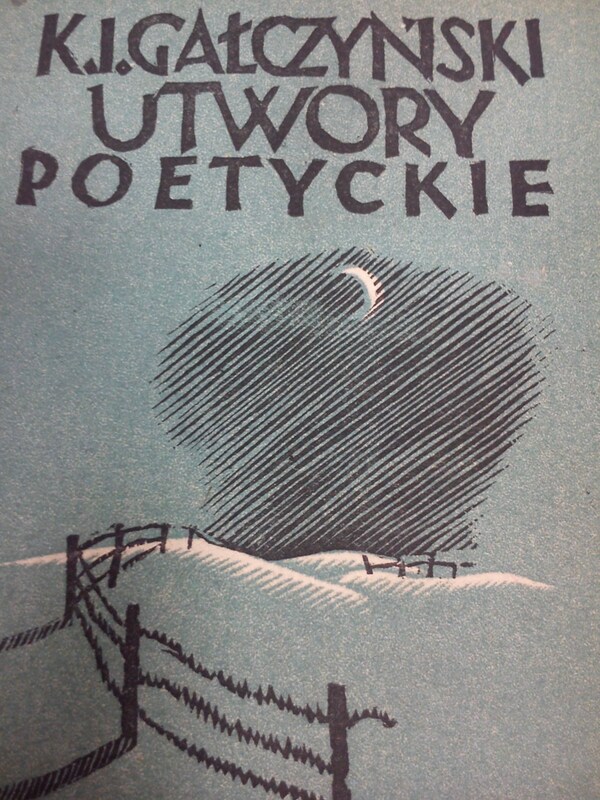 The first collection of his works, Utwory poetyckie (Poetic pieces) was released through Prosto z mostu in 1937. The last booth on the rhyme market is in agony, screeching pathetically. Souteneurs, pharisees, pimps and the pun-makers of poetry lie around scattered. Ugly corpses. Since the beginning alcohol formed part of the Gałczyński legend (his history teacher from junior high school is said to have found a drinking companion in him). It was a significant element of the bohemian lifestyle of Warsaw youth. His extreme experiences with alcohol were documented in the surrealist story entitled 'Porfirion Osiełek,' whose protagonist drinks vodka with peppermint that “made the brain go green.” Yet according to Ryszard Matuszewski’s memoirs, Gałczyński was as heavy an alcoholic as Broniewski. He did not have to drink daily, with only the first shot of vodka soothing his bad temper. Anna Arno, a biographer of Gałczyński, states that Galczyński’s addiction to alcohol was characterised by periods of hard-core and dangerous binges interspersed with long months of complete abstinence from alcohol as well. The memory of the poet’s friends suggest that his drinking binges were terrifying. He suffered a lot and he was aggressive and difficult to calm down. However, between these bauches he was capable of refusing a drink, always to the surprise of those close to him. He must have visited Anna Kowalska on one of his debauches, as she recalls his monologues as a “bredouillement d'ivoigne” (drunk gibberish). At times, his writing was murky. The Green Konstanty and the Silver Natalia – such are the first associations that pop into our minds when we think of Gałczyński’s poetry. Gałczyński devoted uncounted poems to his spouse, rhyming her glimmering eyes, silver hips and caucasian walk in myriad ways. The couple married on June 1st, 1930, when Konstanty was 25 and Natalia 22. Yet there are those, such as Józef Łobodowski, remarked that his poems about Natalia are barely sensual, with an erotics closer to Plato than to Catullus or Bocaccio. Some have complained that he wrote about his wife, for his wife, and for their anniverasaries. These poems also constitute the better known Gałczyński, the more popular of his faces, with quotes that still often adorn wedding inviatations. Gałczyński is the popular poet thanks to his marital verse. According to Anna Arno, he made the theme of fulfilled, domestic love, a love that persists among everday accessories and kitchen scents, into his specialty. This angelic picture of family happiness and a faithful love is contradicted by the war-time period in the poet’s life. Gałczyński spent most of this time in the POW camp in Altengrabow by Magdeburg. He had affairs with three women at the time, and it seems that he wanted to marry each of them. Between 1945 and 1946 he proposed - almost simultaneously - to Lucyna Wolanowska, who had just been freed from Auschwitz and who gave birth to his son, as well as to the young poet Maruta Stobiecka and to Nela Micińska. If we add to these three a Venetian beauty to the camp that fascinated Gałczyński (he wrote the Na śmierć Esteriny or To the Death of Esterina poem in her honour), we get a picture of both emotional luxury and confusion. After the camp’s liberation, Gałczyński didn’t return to Poland for a long period of time, most likely due to this confused situation. He went further than that - he did not give any sign of life, and even deliberately did not clear up rumours of his death. There were farewell articles released in the Polish press, authored by Jerzy Turowicz and Tadeusz Wittlin. Gałczyński described the complicated state of his spirit in the text entitled Notatki z nieudanych rekolekcji paryskich (Notes from the failed Parisian retreat). 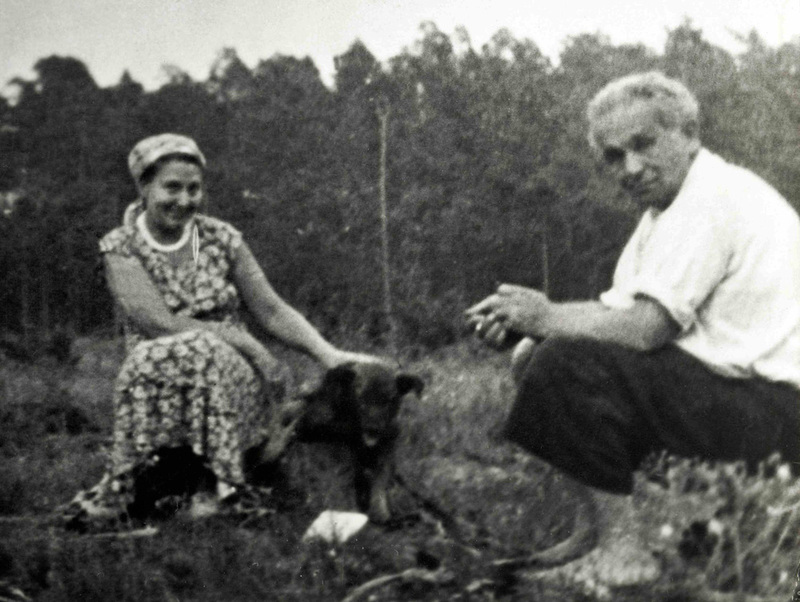 He returned to Poland and to his wife in 1946, only then to return to Kraków with one of his lovers, Maruta Stobiecka. A few days after their arrival, Jan Dobraczyński took Stobiecka to Warsaw and put her in... a convent. Only a few weeks after Gałczyński wrote a poem for her, declaring he had to go astray in order to finally comprehend she was the meadow, the tree, the moon and the leaf. The scattered poet and fiancee soon became the inspiration for the figure of Hermenegilda Kociubińska, one of thee Green Goose Theatre characters. In Kraków, the poet began his intense collaboration with the Przekrój magazine. He published lyrical works with Przekrój, but most notably, in a regular column of the weekly, he created the pure-nonsens Green Goose Theatre and Letters with a Violet. These entries were what really won him his fame. In the Green Goose, Gałczyński created a gallery of colourful characters. There is Piekielny Piotruś (The Infernal Peter), an honest young man Alojzy Gżegżółka, the dog Fafik, faithful to the Green Goose, the master of morals, donkey Osiołek Porfirion, and angelogist Professor Bączyński, and the aforementioned Hermenegilda Kociubińska. 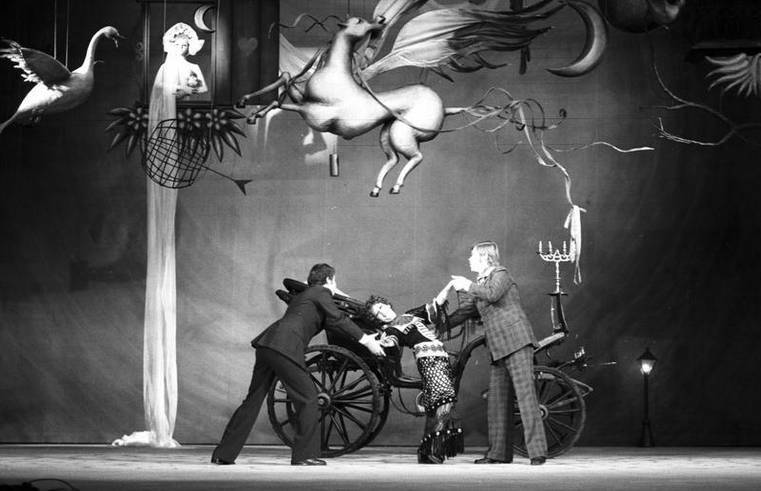 Irena Kwiatkowska, an iconic Polish actress regularly imperosonated Hermenegilda in her performances with the Seven Cats’ cabaret. The Green Goose period came to an end with the so-called Gałczyński affair. In June 1950, at a state literary meeting, Adam Ważyk accused his work of a petty burgeoisie spirit and summoned him to "twist the head of the little canary bird that made his home in the verses". In turn, but unofficially, the poet responded that the canary bird could be killed, but then the birdcage would come to the fore. "What do we do about the cage, my friends?" he asked. Gałczyński was forced to propose a self-critique, and he took this experience very hard. Riding the wave of adapting to socialist poetics, he even wrote Poemat dla zdrajcy (Poem for the Traitor), dedicated to Czesław Miłosz. In 1951, Miłosz asked for political asylum in France, and he later portrayed Gałczyński as Delta in his Captive Mind. But what was Gałczyński’s true stance towards communism? Anna Arno has found a sketch of a poem, wherein he marked a line across the page and at the bottom, he added, “And all this thanks to the Red Army.” Gałczyński preferred writing about the charms of everyday life, and falsely added it was thanks to the Red Army. He was capable of writing well even when the topic was commissioned. This was the case with a poem after Stalin’s death, included in an anthology with other poems about the soviet leader’s passing. Gałczyński’s verse stood out against all others, in the words of Konstanty Jeleński, due to his “owning the Midas’ secret of transforming each and every imposed topic into poetry.” During the communist era, however, this effortlessness of writing was also a curse. Gałczyński always wrote on demand: poetry was his life and his means of living (he only had one other job in his life, at a diplomatic post in Berlin in the 1930s). He was able to negotiate and remind others about his pay, and during the period of collaboration with Przekrój, at the height of popularity of the Green Goose Theatre, he earned a very comfortable living. Gałczyński was fully aware of his dependance on the sponsor, writing “well, I do have a job in this company / of falsehood, iron and paper.” It is the desire to make money that best explains his pre-war collaboration with Prosto z mostu. He was not only ready to write on any subject but also in any... size. Apparently, when Janina Ipohorska requested a piece “5 centimeters high and 5,2 cm wide,” one that would fill up a hole in the layout of one Przekrój page, he took the demand seriously. According to Jerzy Waldorff, after 15 minutes, a poem of this exact size was ready. The reader was presented with a meticulous buffoonade, a surrealist theatre of meanings, allusions and suggestions that mutually erased each other, and created a colourful chaos in the mind. A kind of ethereal mess, that a most trained critique could not put in order for years. One can evoke the ongoing polemic between Sandauer and Stawer, around pieces such as Kolczyki Izoldy (Isolde’s Earrings) and the Skumbria w tomacie (Scumbria in Tomato).